Although The Oberlin School of Commerce closed in 1973, a group of former students and friends of that once prestigious school have worked to put together a brief chronological history of the school. Information was obtained from Professor Robert Fletcher's History of Oberlin College, materials in the archives of Oberlin College, Lorain County histories, personal memorabilia (such as The Reminder, The Oberlin School of Commerce newspaper, advertisements for the school, photo graphs, and recollections) to put together this history. We thank all who contributed and hope we can continue to add to the basic outline here presented. 1845-1850: As early as 1845, F. G. Folsom taught classes in bookkeeping and penmanship in Oberlin. With the growth of business and industry there was a demand for clerks, office workers, and bank employees. Before typewriters, legible as well as so-called "ornamental" penmanship were taught as an end in themselves. All records, accounts, correspondence, diplomas, and other documents were written by hand. 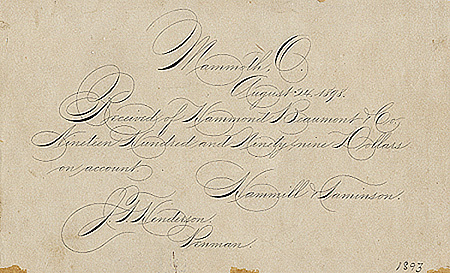 So-called "ornamental" penmanship was beyond neat and legible penmanship. Mastering the art required hours of practice to learn to execute the scrolls, flowing lines, shaded letters, flowers, and even animals--all drawn/written with pen and ink. Marriage licenses, diplomas, calling cards, and other more official documents were often done in "ornamental" penmanship. Students paid so much a lesson or for a course of lessons and Folsom taught for a period of approximately five years. According to Fletcher, "In those early years the Commercial Business Institute bore about the same relationship to the College as did the Conservatory of Music. Students very often took courses in the College and the Institute. The Conservatory, however, grew into the College, whereas the business school grew away from it." Later Fletcher states that "records seem to indicate that after the Civil War the Business School became finally and fully separated from the College and has been a separate institution ever since." Following Folsom there were other penman who taught their art in Oberlin. One of the most noted was Platt Rogers Spencer, author of the Spencerian Writing System. Spencer traveled around from the 1830s until his death in 1864, lecturing, giving writing lessons, and teaching. He published a series of copy sheets and copy books beginning in 1848 which eventually made his system of handwriting/penmanship famous. Fletcher notes the following announcement of the business school in the Oberlin College catalogue of 1860 to 1864 and also for 1865-66 but not thereafter. Fletcher included the following announcement in the O.C. catalogue for 1860-1861 which reads as follows: "...It (meaning courses at the business school) is under the direction of experienced and able instructors, and embraces in its courses the most approved form of bookkeeping, and all branches of Commercial Science usually taught in similar institutions. The Spencerian System of Penmanship is taught under the supervision of its author. Students in the Institute are required to observe the same regulations as to general conduct, as the students of the College." "BUSINESS EDUCATION: Those desirous of obtaining a GOOD SOUND, PRACTICAL, BUSINESS EDUCATION, will please examine particulars concerning the above College in adv. on first page." For a short time, W. F. Lyon taught penmanship for Calkins. Later, in 1872, he came back to Oberlin from his previous employment and opened a writing school. He gave penmanship lessons to "Ladies from the college" as well as to students in the Telegraph School. It appears that there was much movement of those involved in the operation of business colleges. Also, there was a demand for well-trained workers in all types of businesses. 1877 - W. F. Lyons had an attack of writer's cramp (the carpal tunnel syndrome of its day!) and had to give up teaching penmanship. Thus, he sold out to McKee who continued to operate the school as the Oberlin Business Institute. Penmanship was the main subject and McKee was listed as principal. 1880 - Uriah McKee, who was concentrating on the teaching of penmanship, opened a business department. 1883 - A new department was added: shorthand and typewriting--all the latest technology! Regular courses in bookkeeping and arithmetic were also expanded and strengthened according to the school's advertisements. Spring 1884 - John T. Henderson attended the school. He came from Berea University, Berea, Ohio (now Baldwin-Wallace) where he had been studying and teaching. His main reason for attending was to study "ornamental" penmanship under McKee who excelled in the field. Sept. 1884- After completion of the penmanship course, Henderson began work as a teacher at the school. Later, he bought half-interest in the school from McKee. At that time it was called M'Kee's Oberlin Bussiness College. Also, Prof. J. E. Newton (of Oberlin College) Instructor in German. It would appear that the relationship between Oberlin College and the business college extended beyond the end of the Civil War cut-off stated by Professor Fletcher in his History of Oberlin College. The article in THE BUSINESS WORLD further stated that the school "has been removed from College St., to the new Union Block on S. Main. The new rooms are 90 ft. long, the entire length of the block and capable of indefinite expansion." McKee and Henderson stated that "We do not promise you a short but a thorough course, long or short. The majority complete their courses in 4 months and a few in 3 months. There are no vacations and no time-off between terms. Students may enter at any time." Thus in September of 1884, J. T. Henderson began his long career as teacher, principal, and finally president of the school. He remained at the school as president until his death in August 1939, a total of 55 years. He was president for 50 of those years. Under his leadership the school grew and prospered. Henderson was also president of the People's Banking Company and a founder (in 1893) of the Anti-Saloon League. 1889 - J.D. Yocom, Secretary. During the early years of Henderson's long association with the school, Yocom was associated with the school as part owner and teacher. Yocom had studied at Western Reserve Law School and was described as a capable and effective teacher. He was associated with the school until approximately 1925. 1892 - McKee's health failed and he gave up the school. 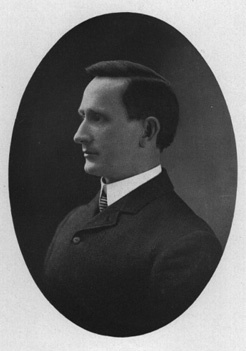 J. T. Henderson purchased McKee's interest in the school. 1894 - Since that time the school was managed by a Board of Directors. 1895 - The school was incorporated under the same name, The Oberlin Business College, under which name it remained until 1929, when the name was changed to The Oberlin School of Commerce. 1896 - After being at several locations, the school moved to a more permanent home on the second floor of the Beckwith Building. 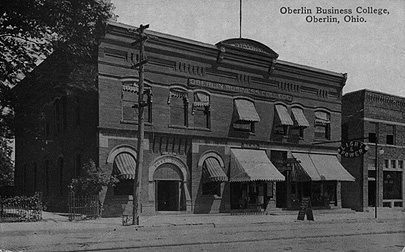 Oberlin's Post Office was situated on the first floor for many years. The School office and accounting department as well as cloak rooms and rest rooms took up the space in the Beckwith Building. 1908 - An advertisement for OBERLIN BUSINESS COLLEGE in the HI-O-HI pictures J. D. Yocom, as secretary, and J. T. Henderson as president of the school. Fall term would begin on September 8, 1908. According to the ad, "new features for the coming year will be a course on Investments taught by President Henderson." 1910 to 1928 - GEORGE L. CLOSE was associated with J. T. Henderson as an outstand ing commercial teacher. He was secretary and treasurer of the school, had served in World War I, had married Henderson's daughter, Alice, and was the father of William and James Close. In 1928 he was killed in an auto accident. 1914 - After the Hobbs Building was constructed on South Main Street adjacent to the Beckwith Building (which housed the Oberlin Business College), additional rooms were available in the Hobbs Building for the shorthand department. The shorthand department was reached by a covered walkway between the two buildings. The typing department was situated in the south section of the Beckwith Building and just adjacent to the covered walkway. At this time, approximately 300 students were enrolled annually. 1915 - The Oberlin Business College was placed on the accredited list of Ohio Colleges and authorized to give a two-year training course for commercial teachers. Such a course could lead to a state certificate. This was authorized by the State Department of Public Instruction. Oberlin Business College was the first business school to be placed on the accredited list of Ohio colleges and was the only one for some time. The course was offered for twelve years (until 1927) and many graduates of the course received the state certificates and were employed to teach commercial subjects in high schools throughout Ohio and several other states. The teacher training course was discontinued in 1927 when the State Department of Public Instruction ruled that all commercial teachers must have a four-year college course in order to be certificated to teach commercial subjects in Ohio high schools. 1916 - The Oberlin Business college was under the management of the following Board of Directors: J. T. Henderson, President; J. D. Yocom, Vice-President;G. L. Close, Secretary; C. A. Barnett, J. F. Campbell, Hon. A. R. Webber, and Dr. Lyman B. Sperry. Lorain County History (1916) notes that "Since Professor Henderson has been associated with the school, attendance has almost doubled. Its present prominent position among similar colleges is largely due to his untiring efforts." Lorain County History (1916) included considerable biographical material about John T. Henderson as well as information about the Oberlin Business College. It noted his superior skill as a penman and his practical experience in the banking business (he was president of the People's Bank in Oberlin from its beginning in the early 1900s to his death in 1939). The history mentioned that he had been teaching a Wednesday afternoon lecture course for several years. Among the subjects of his lectures: "Elements of Success in Life," "Our Domestic System of Exchange," and "Banking." The article further stated that Henderson was in the front rank of business educators of the day. 1921 - An article in the Oberlin News, April 6, 1921, carried the headline BUSINESS SCHOOL STILL GROWING. According to the article, the Oberlin Business College had taken over the second floor of the Hobbs Building a few years before and was now adding to the second floor of the Beckwith Build ing with room to accommodate fifty more students (for those who pursued the two-year Business Administration Course.) Further remarks: that Oberlin Business College was "one of the biggest and best colleges in the country." Later, "Much of the credit for its success goes to President Henderson, who has devoted his life since early manhood to the building up of a business school which is second to none....he has been ably assisted by J. D. Yocom, Vice-President, and George L. Close, secretary, the three men combining in a very unusual way, both teaching and business ability." 1921 - Oberlin News, August 24, 1921, headline read, BUSINESS COLLEGE ACQUIRES HAMMOND LAW LIBRARY. The article stated that the "fine law library belonging to the estate of C.A. Hammond" would now be the property of the Oberlin Business College. The teaching of business law was an important subject and at that time had been taught at the school for more than ten years by C. R. Summers, a local attorney. 1926 - J. H. Kutscher, A.B., joined the staff of the Oberlin Business College as Secretary and Principal. Kutscher was a graduate of the University of Pittsburgh and had taught commercial subjects at Schenley High School in Pittsburgh for seven years. He had also taught at Spencerian School in Cleveland and had worked as bookkeeper and teller at a bank in Cleveland. He thus combined both business and teaching experience. He had been president of the National Association of Commercial Teachers and was also an officer in Ohio Business Schools Association. 1927 - E. K. Etoll was asked to join the staff at the Oberlin Business College full- time after a successful summer's work recruiting students. He was in charge of school athletics and from 1929 to 1939 was in charge ofregistration and placement as well. 1928 - Tragedy struck for those most closely associated with the school. From 1910 to 1928, George L. Close was associated with J. T. Henderson as commercial teacher and secretary of the Oberlin Business College. Oberlin College Alumni Magazine, December 1928, carried the following notice: "George L. Close, husband of Alice Henderson Close, died October 30 in Oberlin Memorial Hospital as a result of an auto accident the week before. He was Secretary of the Oberlin School of Commerce and an influential and highly respected citizen of Oberlin. Survived by his wife and two sons: Willian, - age 9 and James - age 6 mo." 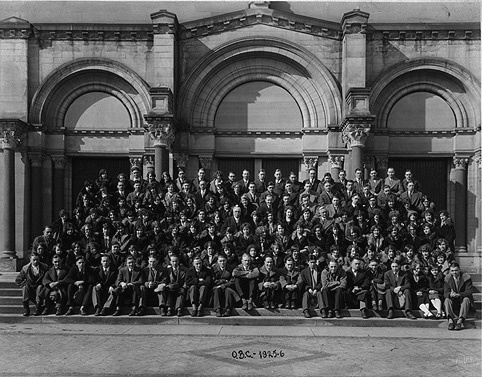 1928 - The two-year business administration course was added. The 15-month secretarial course was also lengthened into a two-year secretarial course and included other business subjects. 1928 - (or 1929 - available information differed) Name of the school was changed to THE OBERLIN SCHOOL OF COMMERCE, INC.
1931 - THE OBERLIN SCHOOL OF COMMERCE REMINDER, Volume V, Number 7, July 1931, read that "Nearly ten thousand young men and women have been students in this school during the past forty-seven years and Mr. Henderson has had the rare privilege.. .of knowing all of these young people....From present indications, the coming school year, which will open Tuesday, September 8, 1931, will prove a banner year." This was the closing of Henderson's 46th year as teacher and president of the Oberlin School of Commerce. Students needed to be high school graduates and entrance was only at the beginning of a term. All work was conducted in regularly organized one-hour classes. 1935 - Robert R. Barr began teaching at the school. He was a 1931 graduate of Oberlin College and had had business experience as well as having taught in commercial schools. He began work at the school in January 1935, teaching advanced accounting, psychology, marketing, etc. 1936 - The OBERLIN SCHOOL OF COHMERCE was admitted for membership to the American Association of Junior Colleges--a membership which it held for many years. 1939 - The end of an era--J. T. Henderson died in early August at the age of 77. His obituary noted that he had been head of the business school for almost fifty-six years. 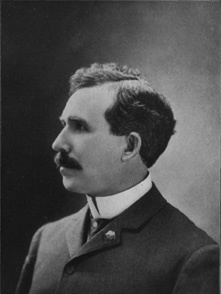 It was stated that Henderson was elected president of the People's Banking Company when it was established in 1906 and still held that office at the time of his death. 1939 - The Oberlin Times, September 7. The headline read: SCHOOL OF COMMERCE OPENS UNDER NEW MANAGEMENT. New officers: J. H. Kutscher, president; E. E. Etoll, vice-president & treasurer; R. R. Barr, secretary. Kutscher started work at the school in 1926 and had been in charge of the educational program at the school since 1929. He was a member of Oberlin Village Council (later, its chairman). D. B. Noble was listed as a new teacher who would assist Etoll in athletics as well as teach business courses. Juanita Schramm had taught at the school for several years and was head of the stenographic department. Miss Betty Whitney was secretary to the president. 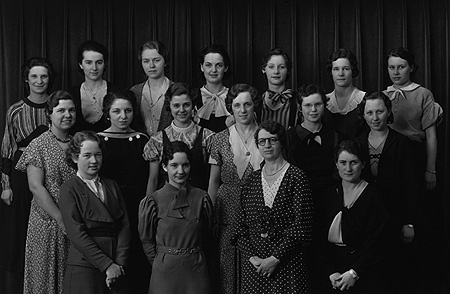 Beta Gamma Sigma Sorority, 1932-1933. 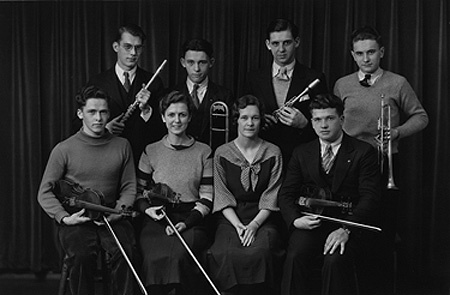 Juanita Schramm is pictured in the middle row, far left. Photo courtesy of the Oberlin Historical and Improvement Organization. 1943 - E. E. Etoll died. 1946 - January - Stockholders' Meeting: R. W. Soens, formerly employed by H. M. Rowe Publishing Company, elected vice president. It was stated that he had a wide acquaintance with business schools and had at one time operated a business school in Duluth, MN. Mrs. Soens taught in the secretarial department. During the years from 1935 through 1945, twenty-two states and four foreign countries were represented in the student body. The school maintained an employment service to help qualified graduates obtain jobs. Extracurricular Activities: Basketball, baseball, orchestra, and choir were among activities offered. The school newspaper, The Reminder, contained pictures of various student groups and write-ups of school news, including contributions by students. There was also a Student Council. Early in the year (September) an opening get-acauainted picnic was held in Kutscher's pleasant back yard. A fall banquet for students, staff, and alumni was held near Thanksgiving at the Oberlin Inn. Several additional school dances were held throughout the year and there was at one time a chapter of Alpha Iota International Business Sorority for women students. Assemblies were held from time to time with outside speakers (often former students) who spoke on a variety of business, general interest, and motivational subjects. Out-of-town students sometimes commuted, but many stayed at several school-approved homes during their schooling at O.S.C. Some former students, answering a questionnaire about their extra-curricular activities said that they worked at after-school jobs to help pay their expenses and thus were unable to participate to any extent in other activities beyond their school assignments. One young man who attended the school during the Depression stated that he had to hitchhike back and forth from Elyria as he had no money to pay for trans portation. Former students listed such activities as "played saxophone in the orchestra," "played piano for noon jam sessions," "played trumpet in the orchestra," and girls' basketball. Other activities listed were: orchestra, basketball, Student Council and "none--I had to work." KUTSCHER SELLS SCHOOL INTEREST TO LIMA EDUCATOR. As retiring president of the Oberlin School of Commerce, J. H. Kutscher sold his interest in the school to Carl S. Tumbleson, a man who had more than thirty years' experience in business school operation. It was stated that Kutscher would continue as Educational Director. At that time Kutscher was also chairman of Oberlin City Council. Tumbleson came from Lima, Ohio, where he had owned and operated the Northwestern School of Commerce. He was later joined by his son Robert and daughter-in-law, Ruth Tumbleson, in the operation of the school. It was noted that the senior Tumbleson would devote his time to promotion and registration activities. Later, Kutscher retired from the school but came back for a summer term in 1958 when Robert Tumbleson, vice president, was to serve as a consultant with the U.S. Atomic Energy Commission. 1957 - OLD SCHOOL OF COMMERCE FALLS TO MAKE WAY FOR NEW BANK - So read the head line in the Tuesday, September 17, 1957, issue of the News-Tribune. The Tumblesons purchased the dwelling at 124 East College Street from the George Morris estate. Tumbleson also stated that the large lot would provide room for expansion. During the summer, prior to the move, the secretarial department continued to occupy the Hobbs Building over the Oberlin Laundry as it had for many years. The accounting department was temporarily housed at the Martin Inn (near where the Auto Club is now located. Martin Inn has since been demolished.) The school did locate at 124 East College Street and an addition was built to provide more classroom space. 1963 - An article in the Oberlin Review quoted Carl Tumbleson, president of O.S.C. : "Students come here usually with the purpose of getting jobs. They want to get through and out as soon as possible. Many of the 100 students live at home, but about 20 room in private homes in Oberlin." Courses offered at that time were Business Administration (accounting and related subjects) and Secretarial training. Other courses included: spelling and word study, office machines, payroll accounting, salesmanship, business letter-writing, business English, and penmanship. Students attending at that time reported that "There were no outside activities." Carl S. Tumbleson died. Later, his son Robert and wife Ruth, who had been associated in the business school with him eventually sold the school to Joseph D. Rittenhouse (probably in 1965). Robert Tumbleson later died and his wife retired from the school. Apparently changing times, among other reasons, resulted in the closing of The Oberlin School of Commerce after so many successful years. The headline in the News-Tribune, December 12, 1973, read: SCHOOL OF COMMERCE CLOSES AFTER 128 YEARS. The article stated that the school had "withdrawn its application for certification from the Ohio State Board of School & College Registration." This came after a 4-month probe by the State Board into complaints from 10 former O.S.C. students who claimed they had been unable to get their $250 registration fees refunded after deciding not to attend classes. It was noted that "the school had been operating under temporary registration certification since 1971 and was scheduled to have its application for permanent certification reviewed on Friday prior to withdrawal of the application." The article continued: "The Educational Consultant for the State Board spent Tuesday trying to place many of O.S.C. 's present students in business schools in Lorain. There were fewer than 20 enrolled at the time." The news story stated that Rittenhouse had owned the school since 1965 and had purchased it from the Tumbleson family. Enrollment at that time had been from 75 to 100. Rittenhouse was quoted as saying that the school would be "changing its format due to the lack of students and the competition of vocational schools." These plans apparently never materialized and THE OBERLIN SCHOOL OF COMMERCE, once a prestigious business school with thousands of successful graduates, closed its doors permanently. Click here to see a short timeline of the Oberlin School of Commerce. Click here to read memoirs of a former Oberlin School of Commerce student.